Your horse's teeth wear down constantly as he chews his way through hundreds of pounds of forage and grains. The good news is that your horse's teeth also grow constantly, replacing the worn down areas of his teeth with new, healthy growth. The most common problem equine dentists see is uneven wear on the teeth, but teeth that are covered in tartar, or are loose or have fallen out completely also can cause problems for your horse. Tartar is the result of organic and inorganic matter building up on your horse's teeth. In short, the items your horse puts in his mouth combine very gradually with substances his body naturally produces to create tartar on his teeth. Tartar buildup typically is yellow or brown in color and can have a hard, crusty appearance when you see it around the gum line on your horse's teeth. In horses, tartar most likely occurs on the canines and incisors, though it can occur on all teeth if the condition is severe. Tartar buildup can be affected by the horse's diet or his individual physical condition. 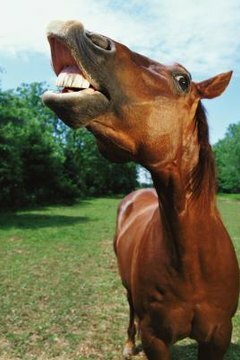 Some horses are more prone to developing tartar buildup on their teeth than others. It is unclear as to why one horse may suffer significant tartar buildup and his companion horse, who lives in the same conditions and eats the same foods, does not. Old age and kidney problems have been linked to excess tartar buildup in horses. Tartar buildup tends to go hand-in-hand with other dental problems. Specifically, horses who have a lot of tartar buildup on their teeth also tend to suffer gum infections. When gum infections occur, the gums can swell and become painful for the horse. If the condition is severe enough and left untreated long enough, your horse's teeth may become loose inside his mouth or they may begin to rot and decay. If your horse has decaying teeth in his mouth, you can expect him to become significantly ill due to the bacteria he is being exposed to constantly. If your horse has a significant tartar problem, you may be able to see a thickened crust of yellow or brown tartar on his teeth. It will be thickest near his gums. His gums may appear irritated or even bleed slightly as the tartar irritates the gum tissue. In severe cases, you may notice signs of infection, including redness, swelling or a foul odor that seems to emit from your horse's nostrils and mouth. The odor will be caused by teeth that literally are rotting inside your horse's mouth. Your horse probably will behave as if he is in pain when you try to handle his mouth and he may be difficult or even impossible to put a bit or bridle on. In addition to tartar buildup and gum disease, loose teeth also can be caused by trauma from an accident, illness or nutritional problems. It also is normal for young horses to lose their baby teeth when they are between 18 months and 5 years. Loose and rotting teeth may fall out with time, but it is best to get your equine dentist to treat your horse rather than allowing nature to take its course. An equine dentist will sedate your horse and then use specially designed dental tools to remove the tartar buildup from your horse's teeth. He also will extract any teeth that are damaged or rotten. Maintaining your horse's dental health with yearly or bi-yearly appointments can help prevent future problems.